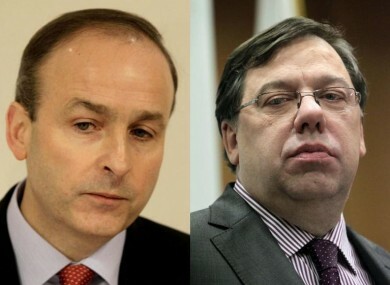 TAOISEACH BRIAN COWEN AND Foreign Affairs Minister Micheal Martin have been appearing on national news programmes to present their different viewpoints on tomorrow’s motion of confidence in the Fianna Fáil leader. The Fianna Fáil parliamentary party will vote tomorrow evening on a motion of confidence in Cowen as party leader. Micheal Martin: “The majority view of those I’ve spoken to in the party and across the country is that we’ll have a better chance of doing better in the election if we had a different leader… It might not be me…” (Martin mentions Mary Hanafin and Brian Lenihan as alternative party leaders). MM: This leadership debate and discussion is “invigorating” and has been “good for the party”. BC: “I believe people are entitled to have an opinion”. He said he expects to have a “civilised chat” at the party meeting tomorrow ahead of the secret ballot. MM: “It’s up to the other ministers and TDs to decide how to vote tomorrow”. MM: The leadership issue didn’t come up before Christmas because the government had the four year plan, the budget and the IMF deal to get through and it “had to make sure those issues were dealt with”. Now that those have been “put away”, an increasing number of TDs have been approaching Martin with concerns about Cowen’s leadership. MM: “My resignation is on the table”, but Martin wouldn’t say if that means he will resign if Cowen wins the motion tomorrow. MM said he wouldn’t speak about that because he didn’t want other party members to be put under that kind of pressure as that’s not what this vote is about. Quotes from live interviews given by Brian Cowen and Micheal Martin this evening on Newstalk’s The Right Hook, Today FM’s The Last Word, and RTÉ One’s Six One News. Email “Media face-off: Cowen and Martin take to the mics”. Feedback on “Media face-off: Cowen and Martin take to the mics”.